The colorful arched gate identifying one of the entrances to Bahama Village is hard to miss when you're strolling down Whitehead Street in Key West FL. However, don't be fooled into thinking this is just another fun and funky shopping district full of kitschy gadgets, trinkets and touristy merchandise. It is, and it isn't. 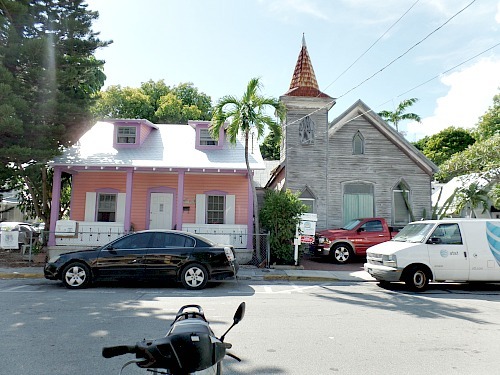 This is a diverse and vibrant Key West community, home to a group of people who immigrated from the Bahamas in the early 1800's. 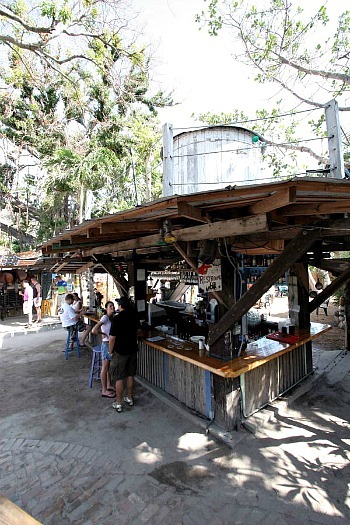 Their arrival introduced the Florida Keys to a rich culture, and interesting cuisine. 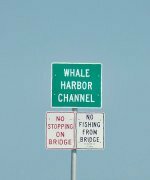 They're also credited with improving the landscape as they brought many of the wonderful tropical plants Key West FL is famous for. The thriving tropical vegetation covers, climbs and cascades over and around most everything in it's path. 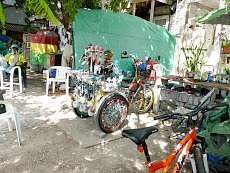 Located about mid-point on the west side of Key West Florida near the Truman Annex, this is a hot bed of activity. 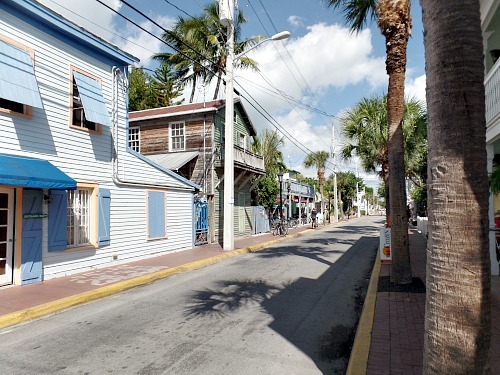 Bordered by Whitehead on the east, Fleming on the north, Fort on the west, and Louisa to the south, this unique Key West community draws crowds throughout the year. Visiting this neighborhood is like stepping into a whole other world. You'll immediately get the unmistakable feeling that you were magically transported to a Caribbean island as the exotic smells and music envelope your senses. Bahama Village Market Key West is also visually stunning, with it's different layers of texture. The cobblestone squares with shops and restaurants are mixed in with a variety of other businesses and charming homes. Bahama Village, like so many places has also gone through a series of changes. Restaurants have now replaced little kiosk shopping areas, but the charm of the area is still in tact. It's also the areas architecture that is unusual and interesting. The homes come in a variety of shapes, colors and conditions. Some are worn and gray, others sport vibrant shades of blues, turquoises, purples, yellows, and reds. The tiny yards often feature a colorful blend of nautical accessories, whimsical paintings and unusual, flashy yard art. 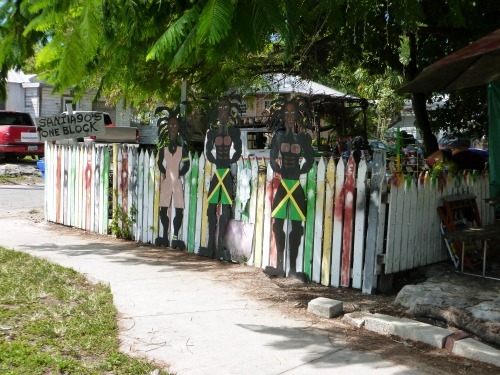 These artistic additions are often found strung on fences or hanging from trees. 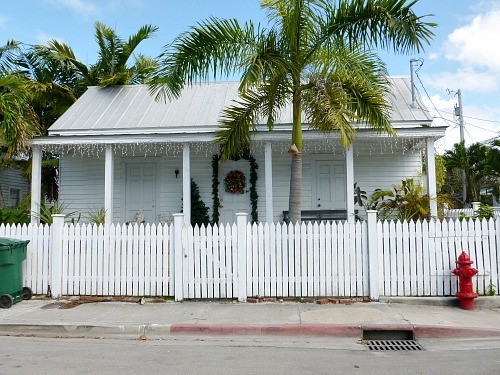 The lush vegetation, typical of the Key West area tumbles over fences, and snuggles up to homes and sheds. Container pots in various sizes and shapes add extra interest and color to porches and sitting areas. 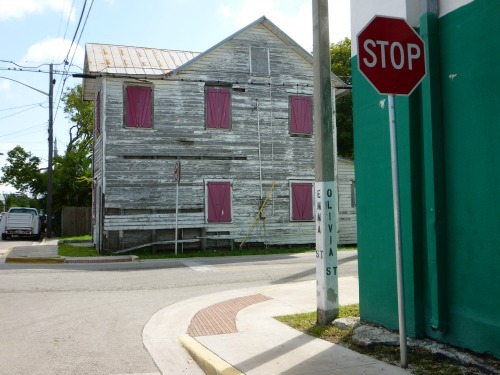 However it's more than just a visual distinction that makes this part of Key West so intriguing. It's also the culture of her people. 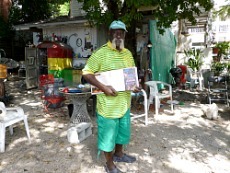 Over the centuries these Bahama Village residents have managed to maintain a strong connection to their African - Bahamian heritage. It's obvious in their style of cooking, in their sometimes worn, but still brightly painted homes, and in their happy, friendly attitude. The combination of lush beauty, vivid colors, exotic smells and unusual wares add to the charm of strolling through this neighborhood. Shoppers will enjoy combing through the flea market, browsing the cute kiosks, and exploring the different shops that provide an eclectic mix of souvenirs, straw hats, Caribbean art, T-shirts, beads, sea sponges and food. 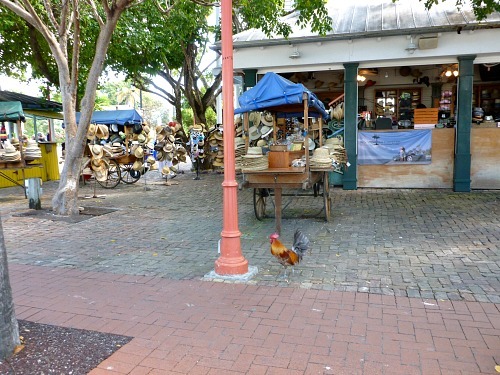 However, no visit to this Key West community would be complete without sampling a blend of it's own special cuisine. Fresh, and delicious, the island influence is obvious. Plantains and coconut, beans and rice, seafood and pork, jerk and curries, the blend of spices and ingredients are mouth watering and aromatic. If the delicious scent of island food wafting through the air doesn't entice you to this neighborhood, perhaps the sound of calypso and reggae music spilling out from windows and doors will. 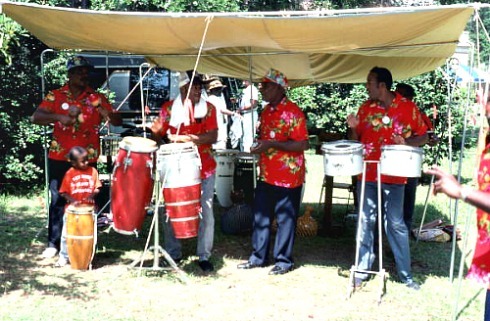 The beat of the music is an important part of life, and the influence of the Bahamian culture is particularly evident when it comes to junkanoo music. Fast paced and rhythmically heart pounding, this style originally relied heavily on goombay drums, and home made instruments including cowbells, whistles, and conch shells. Over generations, the sound has evolved to incorporate more traditional instruments but the beat and adrenalin rushing tones continue. Junkanoo music is also more than just a particular style, it incorporates dance and processions into it's design. Historically this was predominantly a male arena, drawing from secret African societies, but today women are actively involved. The junkanoo bands are an integral part of the makeup that constitutes Bahama Village. Junkanoo music is hugely popular with residents and tourists alike, and the bands get a chance to especially shine during Key West Fantasy Fest. Goombay is the official kick-off for the 10 day adult extravaganza that occurs the first Friday and Saturday of each Fantasy Fest. 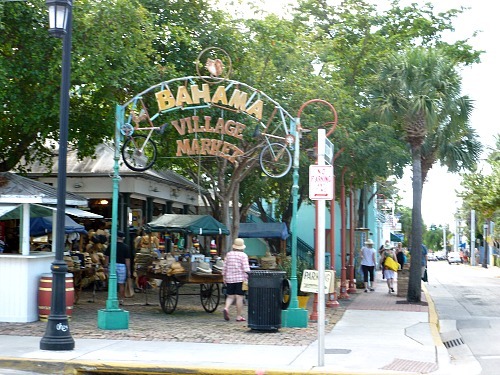 A stroll through Bahama Village will transport you to a different world. 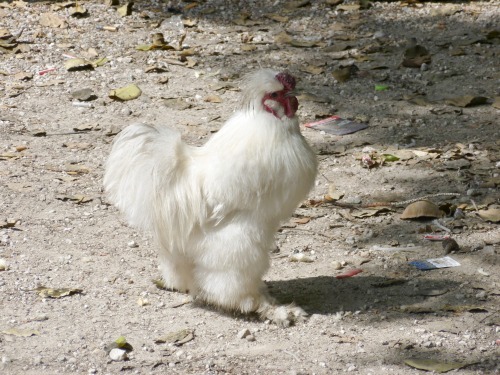 A place where cats and roosters mingle, friendly locals smile at tourists, and vividly bright colors are only outdone by incredibly delicious scents filling the air. Just another slice of paradise, with it's own special dash of spice.